Applies the precise amount of continuous lubrication to 1 or both sides of your coil stock at line speeds greater than 100 ft. per minute (30.5 m/minute). Unique internally-fed design is an unsurpassed solution for metal forming applications when combined with a SPR-2000™ or SPR-2000-JR™ programmable fluid controller. Offers almost limitless sizes over the standard 69.50 in. (1765 mm) width. Unique modular design staggers and overlaps multiple 12 in. (305 mm) wide roller sets for widths over 18 in. (457 mm). Pneumatic roller pressure models available for stock widths from 3 to 69.50 in. (76 mm-1765 mm). dispenser tubes from the fluid controller, it is dispensed evenly across the inside of the roller through these holes. 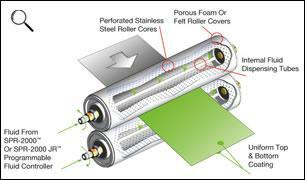 The Uni-Roller® HG option adds an articulating chassis to our Uni-Roller® Type S system. The upper rollers can be raised or lowered to accommodate deformities in the head or tail of coil stock. This prevents damage to the lubricator and facilitates easier loading. Proximity sensor provides input to an SPR-2000™ based on roller rotation. Use when an intermittent press signal is not available. Stock guides* facilitate easy loading of the coil into the Uni-Roller® Type S.
Stock width: 3″ – 70″ and up (76mm – 1778mm+) Wider units available (up to 100”). Contact Unist. Air: Clean, dry, compressed air, 80-100 psi (5.5-6.9 bar),10 SCFM (280 SLPM) minimum.